My orthopedist approved some limited use of my right hand yesterday - just enough to be able to setup and image with my Questar. 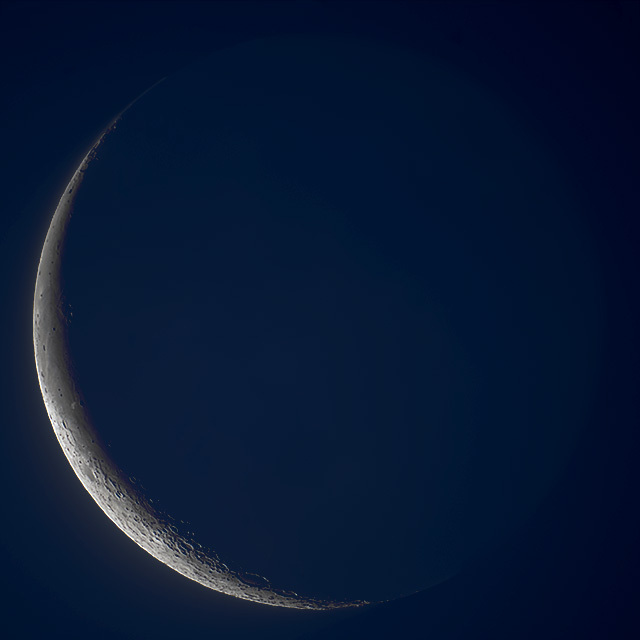 I woke up around 6 AM an noticed the lovely waning crescent Moon in a clear pre-dawn eastern sky. I leapt at the chance for an image in memory of my sister Lisbeth. Questar 3.5 with Sony a6300 at prime focus at 2016-10-27 12:41 UT. Crescent image exposed at ISO 250 for 1/30 sec with best 8 images of 55 stacked in Nebulosity and deconvolved in Lynkeos. Earthshine and sky exposed ISO 250 for 1/sec with best 15 images of 30 stacked in Lynkeos for noise reduction. Final exposure and composition in Photoshop. The jpeg conversion wasn't very kind to the gradients in the dim earthshine, but the tiff looks good and so should prints.